Martin Scorsese read “The Yakuza”, a speculative script sold in a spectacular bidding war in Hollywood in 1974. He wasn’t the director Paul Schrader wanted, however; according to Peter Biskind, Schrader wanted a “Tiffany” director. (1) At this point, Scorsese did not for Schrader occupy a place on that particular list. They spent eight weeks writing three drafts of the script and were finally finished at the beginning of January 1973. Following a meeting at Warner Bros. with John Calley, the script went for auction and sold for an unprecedented amount: $325,000. Leonard took only 20% of the money while Paul and his agent took 40% each. Paul insisted that Leonard only get shared story credit. Schrader’s other agent, Michael Hamilburg, would take a co-producer credit on the film. Then in 1951, Eiko’s brother, Tanaka Ken, returned from the dead – he’d been living for six years in the jungle caves of the Phillipines. He thanked Harry for rescuing Eiko and saving her daughter, but he told Eiko he could no longer speak to her. Don’t forget, this was just after the war. She had placed him forever in debt to his enemy and it was torture for him. Ken left his sister and became one of the most successful Yakuza in occupied Tokyo. Eiko, meanwhile, would no longer see Harry, much less marry him. Harry was beside himself. He tried and tried with Ken – but it didn’t do any good. 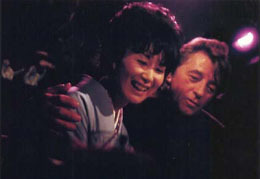 So, when his enlistment was up, he borrowed five thousand dollars from George, bought a coffee shop and bar and gave it to Eiko as a sayonara gift (4) – she still runs it today. • Harry has no family. • Harry is hired to rescue Tanner’s daughter. • Harry is reunited with Eiko, with whom he had a relationship, and who also has a daughter. • Eiko’s ‘brother’ Ken owes Harry a debt. • Ken has an older brother, Tanaka Goro, oyabun or advisor to the clans, whose own son is a violent yakuza, turning against his own father and family. Ken hasn’t spoken to Goro in many years. • In the same way that Harry is ultimately Tanner’s pawn, Goro’s position as counsellor is being threatened by Tono, Tanner’s ‘enemy’ in the yakuza war, who turns out to be his ally. Thus Harry and Goro are also linked. • Ken has retired from the yakuza, his alternative ‘family’. He, like Harry, has no family. • Ken and Eiko’s daughter is killed by Goro’s son in yakuza crossfire in Wheat’s apartment, in a parallel to Tanner’s daughter’s kidnapping, which catalysed the whole story. Ken kills Goro’s son in revenge. • Harry makes a sacrifice to honour Ken, and in doing so becomes a part of Ken’s family at last: his brother. Yeah, Ken has a habit of not speaking to relatives, doesn’t he? Do you have his address? Could I see him? — Yes, he’s insufferable at times. Honourable men usually are. He’s also unique in one other respect – Ken is a lone wolf of sorts, very rare in Japan. He neither takes nor gives orders – years ago he broke from our family when he was to become the youngest in all of Japan – I’m ashamed to admit that when he broke away. I neither assisted nor protected him. But he survived. As a result he is under no obligation to me, and would not welcome my help. Even if he would, this affair with Tono has put me in an awkward position as well. Eiko is afraid to breathe for fear of offending you. That’s all she worries about. Why, I don’t know. — Even for Japan it’s strange. In any case, it’s not your family. This stings Kilmer, really hurts him. No – not, it’s not. Tanaka-san. Someone will pay us to rough up that American, but we don’t want any trouble with you. Ken, looking in the mirror, does not turn and face the Yakuza. What have you been doing all these years, Kilmer? The question really is an acceptance of Kilmer’s position and Kilmer recognises it as such. They turn together and start to walk back. Depends on how you figure that kind of thing. Yes. You have no family, do you? The way Kilmer says this it’s a confession. Everywhere I look I don’t recognize a thing. Takano-san, what were you thinking? Takano removes his mask. Unlike Ken, he’s breathing heavily. He bows. To be as forceful as possible. Because … I’m afraid I’m not aggressive enough. Get rid of thinking you must have a certain attitude. Get rid of thinking. Don’t expect to win … don’t expect to lose. Takano and the others absorb this. But Sensai, what should I expect? Ken’s eyes widen slightly. He straightens up a hair. It’s almost the change of an animal that has scented something on the wind. With the exception of scene ordering in certain sequences, the released film is remarkably faithful to the screenplay draft by Towne. 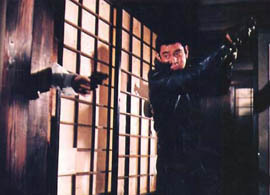 Certain scenes have been dropped entirely, however, including an in-flight samurai movie during Harry’s journey to Tokyo, which may have been a reference too far. Perhaps in order to bring greater symmetry to the story, Eiko’s son is also excised from the story proposed in the screenplay – in fact it is he (Taro) who gets killed at Wheat’s apartment, and Hanako who survives. He no longer figures as a character at all, while Hanako’s death provides a thematic rhyme to the kidnap of Tanner’s daughter. In a highly symbolic screenplay (the opening titles explain the origin of the word yakuza being formed from the numbers eight, nine and three), Hanako’s death also signifies the death of Ken and Eiko’s marriage, and, ironically, the impossibility of Eiko’s marriage to Harry. 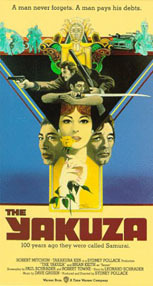 Hanako’s role in the story is highly significant: she has a warmer, more straightforward welcome for Harry than her mother; she explains yakuza rituals to Dusty, who falls for her immediately; and her ultimately violent demise (an ironic antithesis to her name which she explains means “flower child”, in a casual reference to the American anti-war protesters during the then on-going Vietnam war: Dusty is a Vietnam veteran) proposes a softening of Ken’s apparently implacable character. The translations and explanations of one culture to another take place primarily at Wheat’s apartment, which serves as a sort of locus of cultural détente in the film. Paradoxically, it is here that Hanako is killed, perhaps suggesting that such détente is impossible. Ken cuts off his little finger as apology to Goro; likewise, Harry cuts off his little finger as apology to Ken. No man has a greater friend. Schrader meanwhile produced an article called “Yakuza-Eiga: A Primer” for Film Comment in January 1974, a ‘primer’ for an understanding of Japanese gangster movies. (12) It traces the genre’s history from the samurai film and elucidates its themes, conventions and stylistic elements. This article is in line with other of his critical writings; for instance, his famous piece on film noir, published by the same journal. The genre evolved from the samurai film and took its various elements, themes and ethical codes into a modern Japan. It was principally made by the Toei Studios from the mid-1960s and approximately one hundred films a year were made. One of the genre’s fans was a writer called Yukio Mishima. 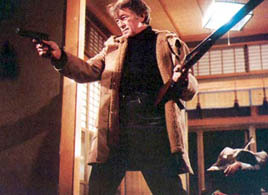 The Yakuza is, of course, also linked with noir, given that its protagonist, Harry Kilmer, could be said to be in a line of prototypical noir detective heroes – an anachronistic throwback, cynical, worldweary, and double-crossed, but with a heart that is steadily revealed to be alive and kicking through the revelatory scenes of his former relationship with Eiko. Interestingly, the script extract published at the top of Schrader article is not credited to anyone but is marked with the copyright of Warner Bros. Studio. It is almost exactly a replica of Towne’s draft, pages 138 –141. Structurally, the screenplay is a clever byplay between an elaboration of conventional narrative exposition and evocations of the yakuza rituals, most of which are founded on violence and honour codes. Rather than obscuring the experience for the viewer, this form of exposition lends itself to the creation of an astonishing character – Tanaka Ken, whose entire post-WW II existence appears to have been founded on an extraordinary personal sacrifice in order to retain his honour and repay his debt to Harry Kilmer. It is not clear when precisely Towne became involved, but it was at the behest of the studio (Columbia and Warner Bros.). In terms of Sydney Pollack’s output as director, the film’s theme, namely, “survival in the face of appalling odds”, seems to belong to what one critic describes as “familiar Pollack territory”, echoing the filmmaker’s concern “with the loser rather than the winner” (15). The reviewer finds that the relationship between Kilmer and Eiko is a “mirror-image” of that between Hubbell (Robert Redford) and Katie (Barbra Streisand) in Pollack’s previous film, The Way We Were (1973). 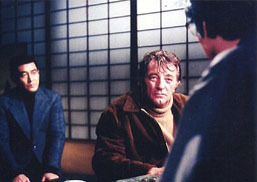 Thus, in typical auteur-critical fashion is located the strand connecting The Yakuza with other films in the Pollack canon – character and theme, bringing together elements of the director’s worldview, as evidenced in his entire output. Similarly, in the review published by Films and Filming, the writer finds “the theme of survival has remained the one consistent strand throughout all his films” (16). The Yakuza draft by Robert Towne, dated 18 December 1973. Peter Biskind, Easy Riders, Raging Bulls (New York: Simon & Schuster, 1997), p. 246. Quoted in Tom Stempel, Framework: A History of Screenwriting in the American Film (Continuum, New York, 1991), p. 231. “she called it ‘Kilmer House’” is an addition to this line in the film. In the film the line is “at least let me get Eiko and Hanako out of here”. Robert Towne speaking at the American Film Institute seminar, 22 January 1975: transcript at the Louis B. Mayer Library, AFI pp: 9-10. Quoted in “Your Write to Win”, The Times, London, 14 April 2003, p. 14. Speaking at the American Film Institute seminar, pp.10-11. In a furthering of the film’s attempt to formally blend East and West, this song is followed by “My Darling Clementine”, that staple of the Western film genre, and all the nightclub audience sings along. The review of the film in Time Out points out that “there emerges the familiar and increasingly explicit relationships of countless American Westerns”. Tom Milne (Ed. ), The Time Out Film Guide, second edition (London: Penguin Books, 1989), p. 754. “The Yakuza”, Films and Filming, Vol. 21, No. 12, September 1975, p. 37. Paul Schrader, “Notes on Film Noir”, Film Comment, Vol. 8, No. 1, Spring 1972. Paul Schrader, “Yakuza-Eiga: A Primer”, Film Comment, January 1974, p. 13. American Film Institute seminar, pp. 9-10. Schrader, “Yakuza-Eiga: A Primer”, p. 15. “The Yakuza”, Films Illustrated, Vol. 4, No. 47, July 1975, p. 405. Films and Filming, p. 36. Michael Sragow, “Ghostwriters: Unraveling the Enigma of Movie Authorship”, Film Comment, March 1983. National Film Theatre programme May 1988: p. 8. He was quoted from the AFI seminar, when he added, “When I had read it, I said these are the things that I felt should be done, and they agreed with me, so I did them. And then where they disagreed with me, we went around with it. But it was pretty much agreed upon with the director and myself.” American Film Institute seminar, p. 11.